Easy one-stop solution to meet your mineral requirements. These perfectly balanced minerals originate from the pristine waters of the Great Salt Lake in Utah, and are harvested through solar evaporation. 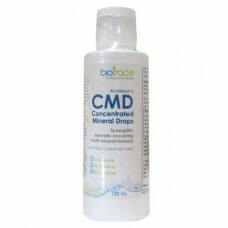 CMD Concentrated Mineral Drops is a dietary supplement that contains 72 Macro and Trace Minerals. Formulated by nature for greater bio electric health & body mineral balancing. Suitable for regular or sodium restricted diets and so concentrated that 40 drops (1/2 teaspoon) equals the mineral content of 1/2 cup sea water with 99% sodium removed. 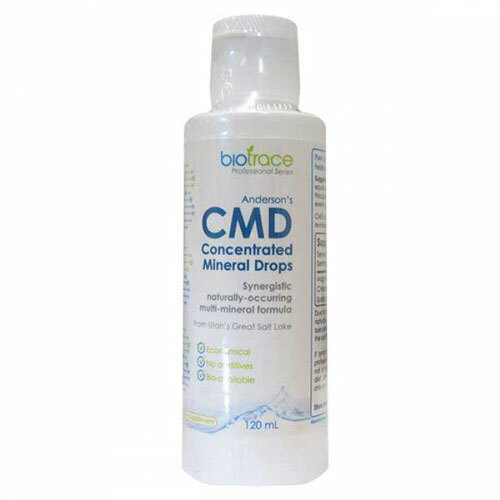 CMD Concentrated Mineral Drops is intended to be a comprehensive mineral and electrolyte supplement that can be confidently used as a complement to all alternative/complementary therapies to provide a complete, full spectrum trace mineral support. Minerals and trace minerals are critical to the health of the human body. They are the catalysts for all the vitamins and other nutrients your body uses for developing and maintaining good health. Concentrated Mineral Drops(CMD) captures the perfect balance of those minerals. Using CMD Concentrated Mineral Drops every day (mix with juice, food or remineralize purified water) will help conduct and generate your body's entire electrical system. People taking these drops normally say they have more energy and generally feel better. To remineralise filtered water: 20 drops, (1/4 teaspoon) per 4 litres. At 20 drops, (1/4 teaspoon) per 4 litres, 240ml will re-mineralize 760 litres. 20-40 drops, once or twice daily, or as recommended by a Health Professional. Mix with any juice, water, smoothie or even add to a coffee.